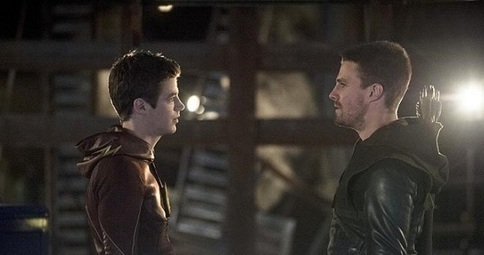 Trailer: ‘The Flash vs. Arrow’ CW Superhero Showdown Event Begins Tonight! An extended trailer for the first part of The CW’s inter-series superhero crossover ‘The Flash vs. Arrow’ pits Barry Allen’s speed versus Oliver Queen’s resourcefulness. Since the show’s pilot and even before, we have seen periodic crossovers between these two superhero shows, but looks like this one will be slightly different, much more of an edge. In the previews they show Barry fighting against the Arrow in some kind of “I’m better than you” standoff, although I’m not sure why this would ever be happening, I suspect all is not what it seems to be in the trailer. Could the evil Dr. Wells have something to do with this, and how long do you think it will take for them to figure out that their mentor is preparing to become the worst villain of all time?